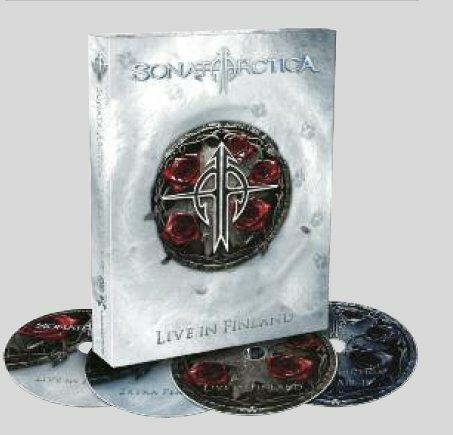 SONATA ARCTICA - LIVE IN FINLAND (2DVD+2CD DIGI) | Online Shop | Wizard LTD. Album: "LIVE IN FINLAND (2DVD+2CD DIGI)"
Finnish Metal wolves SONATA ARCTICA are howling again – namely in the form of a new live DVD! “Live In Finland” shows the full concert which was played on the 15th of April 2011 in Club Teatria in Oulu, Finland. Apart from classics а la ґFull Moonґ or ґLetter To Danaґ, various tracks of the current album “The Days Of Grays“ have found their way into the setlist, thus on the DVD as well. This heady mixture of old and new compositions of SONATA ARCTICA is supplemented by a bonus DVD on which four recorded tracks of the very own SONATA ARCTICA festival can be found, that took place on the 8th of August 2009 in Kemi. Furthermore, the viewer can enjoy the music videos of `Don’t Say A Word’, ґPaid In Fullґ and ґFlag In The Groundґ as well as a photo galery and some making of’s that document the DVD’s creation. The enclosed bonus CD with eight audio recordings of the festival concert puts the final touches on this release, so that “Live In Finland“ will make each and every SONATA ARCTICA fan cry tears of joy. SONATA ARCTICA was born in 1996 on the edge of the world, in the northern Finnish town of Kemi. Summer of 1999 brought us the first single ґUnOpenedґ and Autumn of 1999 marked the release of the very first full-length album, "Ecliptica". Quick rise to fame continued through the end of 1999 and beginning of 2000. Soon after the release of their debut album, SONATA ARCTICA was chosen as support band for Stratovarius&apos; European Tour, winning over 32 other bands from 15 different record companies. The year 2000 brought not only a big tour, new mini-CD, and a small line-up change, but also media recognition. SONATA ARCTICA was chosen as a candidate for "the best new-comer band" by the Finnish Recording Industry Association in their annual Awards Gala, Emma. Needless to say, all of the major metal-releasing record companies were begging SONATA ARCTICA to join their ranks. After negotiations, they were signed to Nuclear Blast. In 2004, the recording session featured also Henric who added fresh spices to the soup, later on called "Reckoning Night". After over three months of hard work, the recordings were finally completed. A headline tour was supposed to follow the release of Reckoning Night, but the band got an once-in-a-lifetime invitation from Nightwish to join their European tour as a special guest. The band opted in – SONATA ARCTICA toured Europe with Nightwish in arenas with capacities up to 12 000 people! During the tour band also played a handful of headliner shows over Europe. The fifth studio album of SONATA ARCTICA was called "Unia". The album was released in May 2007. Before the release of the album a single entitled "Paid In Full" was released in Finland, Germany and Japan. The single hit the #1 position in the official Finnish charts, sticked to second place the following week and stayed in the national top ten until "Unia" was released a month later! In 2009 the bandґs recorded their latest masterpiece called “The Days Of Grays”, an epic record full of traditional Sonata trademarks as well as new tunes and tones; to put it quite simple, itґs become an amazingly good album which once more shows the power of SONATA ARCTICA as they have proved their uniqueness by writing complex, straight-forward yet very catchy music. SONATA ARCTICA stands synonymously for timeless melodic compositions – enjoy their live grandiosity on “Live In Finland”!